In the sixties and seventies several LPs were released. Have you got one of these tucked away in your parent's attic ? "With music composed and played by Freddie Phillips.Sung and narrated by Brian Cant"
Copyright Gordon Murray 1977, first issued as RBT13 in 1972. Two new stories with narration by Brian Cant, and songs taken from the television programmes. Side 1: Peter Hazel the Postman has an adventure. Side 2: Windy Miller goes fishing. 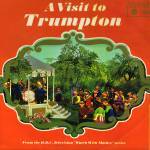 The front of the sleeve shows the Trumpton townspeople gathered in the park watching the firemen in the bandstand. The back of the sleeve has a picture of Miss Lovelace and her three pekinese dogs. 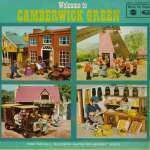 The two stories on this LP include many Trumpton characters and their songs but there is no real plot. See the Trumpton page for the sleeve text. The front of the sleeve shows the Chigley citizens standing outside Winkstead Hall. The record contains two stories about the happenings in Chigley, including all the Chigley songs. See the Chigley page for the extensive sleeve text. (Reverse cover carries the title "All the music from Chigley and Trumpton"). The Trumpton cast are shown gathered in front of the Town Hall, with the clock showing 6:26. The Mayor and Town Clerk are on the Hall's balcony, the Fire Brigade is lined up below in front of the Town Hall entrance, the other characters are assembled in rows in front of the Brigade in the Town Square. All are looking towards the viewer. The Mayor and Clerk are waving. The Band Concert (Trumpton Fire Brigade Band play in the Park). SIDE 2: CHIGLEY "All the music from Chigley and Trumpton"
The Chigley side cover has Lord Belborough and Mr. Brackett, his butler, on the footplate of the steam engine. Mr. Farthing, Mr. Creswell and Winney are posing in front of the engine. All are looking at the viewer and waving. Front Cover Illustration: By courtesy of The Hamlyn Publishing Group Ltd.
Track listing: as for "All the Music from Trumpton And Chigley"